There is no question about Google being the dominant player in the search engine market. Internet search evolved from Dogpile to Alta Vista, all the way to Google with many more players in between. 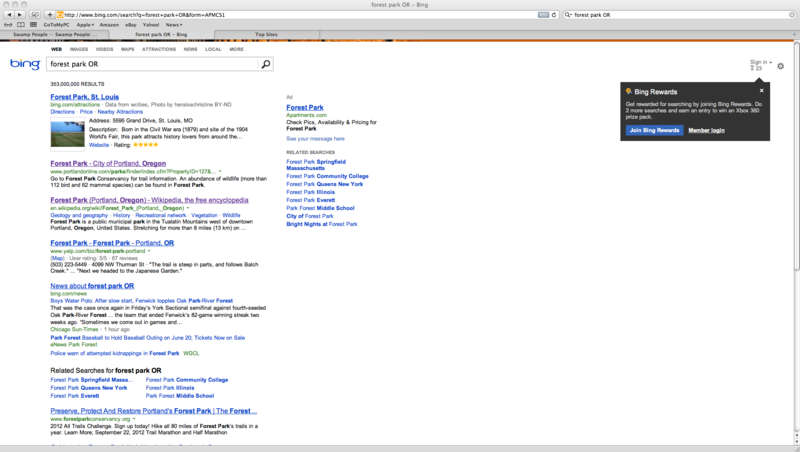 Bing search result resembles Google closely. What was surprising to me, was the pop-up window in the upper right of the screen. The pop-up suggests that I signup for Bing Rewards (more on this later), do 2 additional searches and enter a sweepstakes for an Xbox 360. While I wasn’t wild about entering a sweepstakes for an Xbox, the concept of trading searches for product was intriguing. So I dug deeper. Example products/services to redeem your ‘rewards’ on. 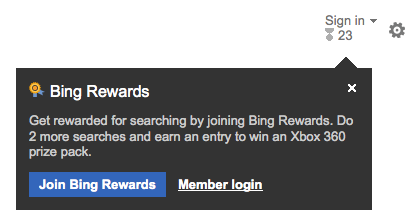 It seems that Microsoft is eager to get people to use Bing, so they’ve come up with something called Bing Rewards. Very much like a rewards program for your credit card, you earn points for each internet search. Once you collect enough points, you can redeem them for coupons and product like a $5 Amazon.com gift card or even 60 minutes of Skype credit. The part I thought was especially thoughtful was the ability to turn your rewards into a charity donation to an organization like TeachForAmerica or DonorsChoose.org. While I will happily use Bing as my default search engine going forward without the inspiration of collecting BingRewards, I have to hand it to Microsoft to sweeten the search engine Battle and reward customers for their data, rather than stealing it (as Google does). 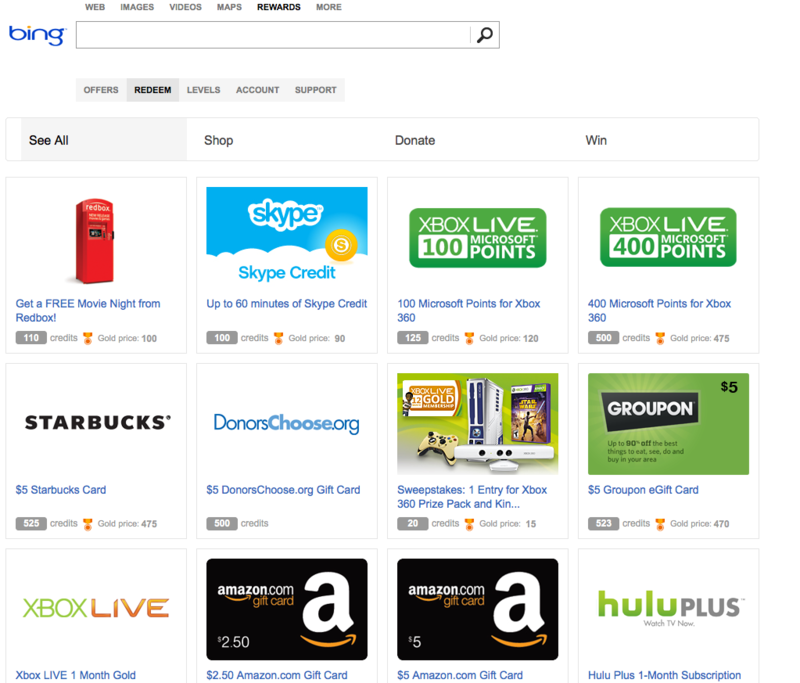 If you use BingRewards and can speak to the program, please leave a comment. I, and the rest of my readers, would love to hear about your experience.